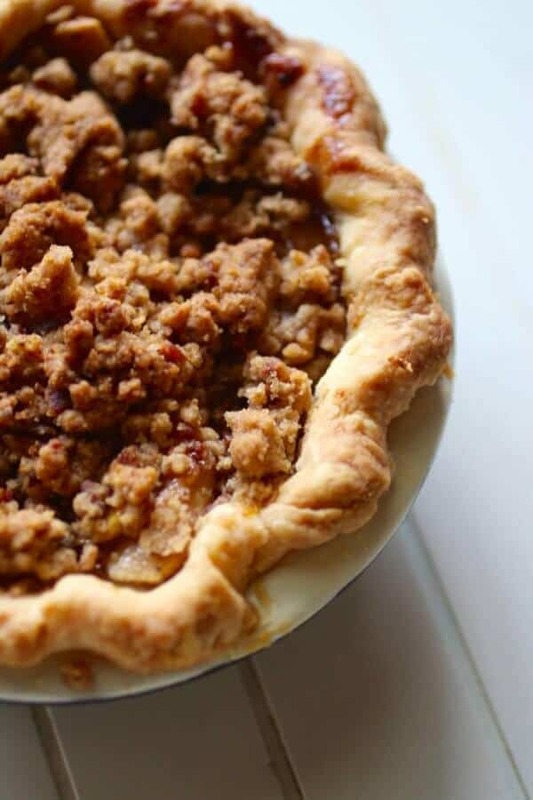 Welcome Fall with these cozy bourbon apple tarts covered in a sweet-salty bacon streusel. A buttery, flaky crust holds tender apples that have been mixed with cinnamon, cloves, and bourbon. Then they’re all covered with crumbly, crispy, smoky, bacon streusel. The rain and cool weather continue here in Dallas making it seem more and more like late October instead of mid-August. Seriously, we’re wearing sweaters as I write this. With this kind of weather it’s hard for me to think of ice cream and fresh fruit. It’s definitely putting me in the mood for pies and cakes! When I was little my grandfather used to make me breakfast when we visited. We were both early risers, enjoying the quiet as the sky outside the window turned from black to purple to pink. My favorite breakfast was a pie that he made with apples and sausage. He said that the sausage made it breakfast food and I wasn’t going to argue. It’s been decades since I had that pie but the other morning it was camped out in my brain. I thought about it so much I could almost taste that apple pie so I decided to try to replicate it. Walmart is like four minutes away. Off I went. Once in the store I headed over to pick up the sausage when I stopped short. Among all of the meats I saw Jimmy Dean Bacon. I pretty much always buy Jimmy Dean sausage but I somehow missed the fact that they also made premium bacon. 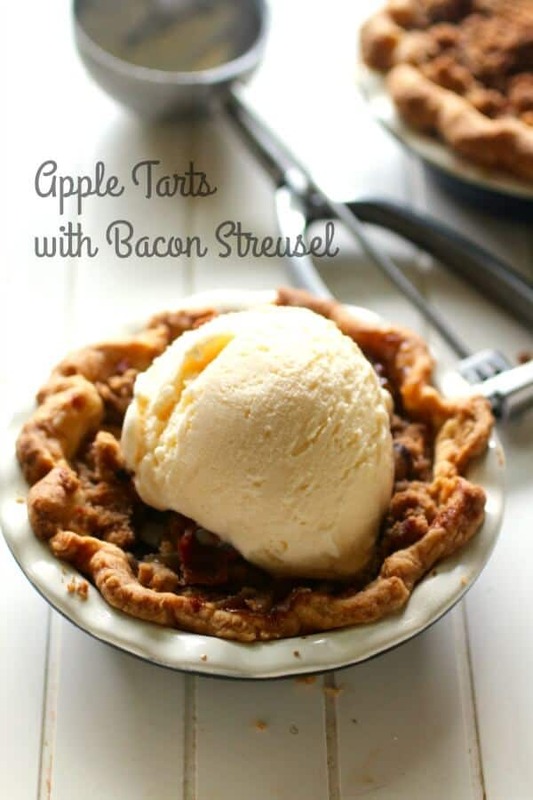 All of a sudden my plan changed a little bit and I decided to make the pie into bourbon apple tarts with bacon. A bacon streusel? 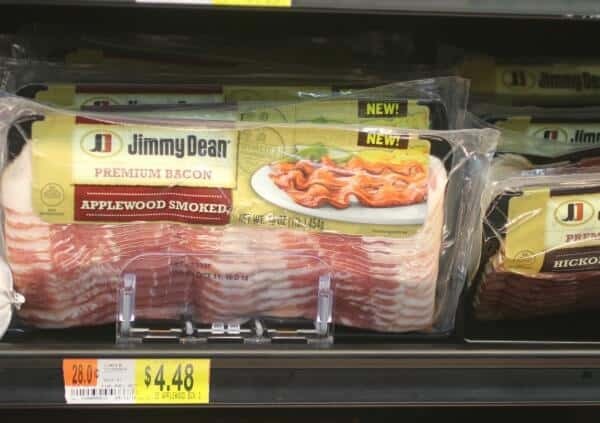 I chose the applewood smoked variety of Jimmy Dean bacon because I thought the hint of apple flavor would complement the apples in the filling. It absolutely did! You can choose the Jimmy Dean hickory smoked bacon if you prefer it. 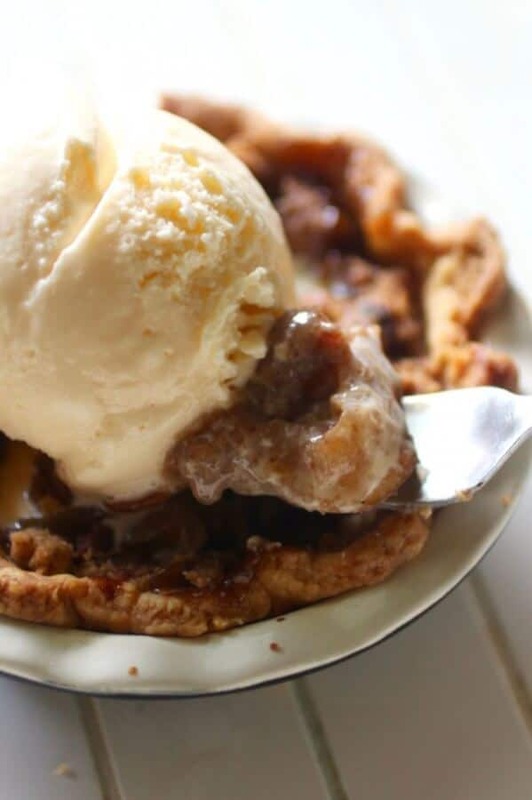 The best way to make an apple pie filling is to combine several types of apples. There’s something about using a variety that makes the flavor more intense. I chose Honeycrisp, Jazz, and Granny Smith because I wanted a sweet apple flavor to go along with that smoky bacon. You can even print out a Jimmy Dean bacon coupon here. Really, saving money on bacon? It just doesn’t get better than that. I just can’t stop wondering why I haven’t tried Jimmy Dean bacon before. It’s not how ya start, it’s how ya finish, right? When you make these tarts, and you will because they are delicious, be sure to use #JimmyDeanBacon and #RestlessChipotle hashtags! I love to see what y’all are making! A buttery pastry is filled with sweet apples and topped with salty, smoky bacon streusel. 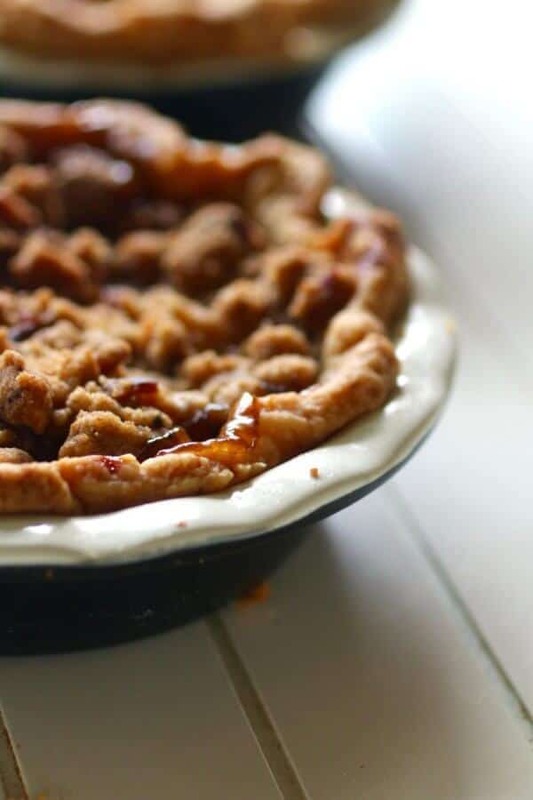 This unusual pie is full of fall flavor. 8 medium sized apples, I used 3 Honeycrisp, 3 Jazz, and 2 Granny Smith, mixed varieties , peeled, cored, and sliced. 2 tablespoons butter, melted and allowed to turn golden brown. Mix the flour, sugar, and salt together in the bowl of a food processor. With processor running add the cubes of butter. Pulse until the butter and flour form "pebbles". Add the buttermilk and pulse just until the mixture forms a ball. Remove from food processor, flatten into a thick oval. 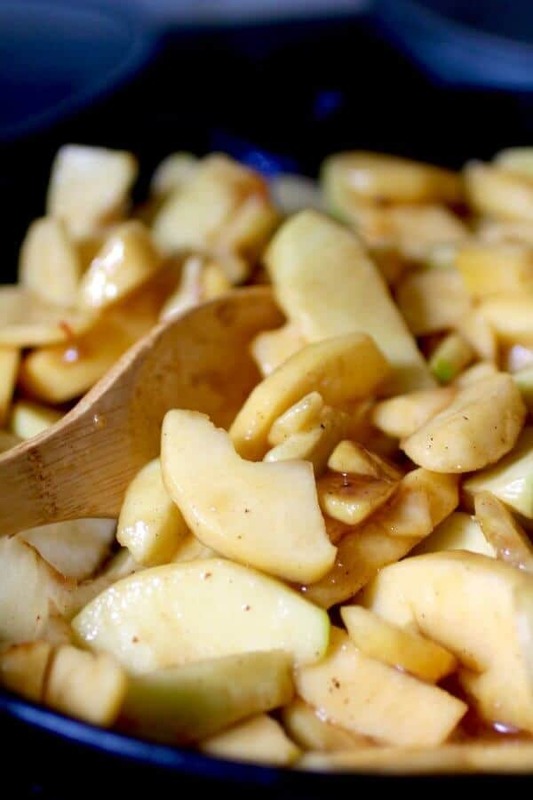 Add the apples, brown sugar, white sugar, cinnamon, salt, cornstarch, and bourbon to a bowl, mixing gently with a large spoon. Heat the pan of bacon grease back up. Add the apple mixture and any juice that has formed. Simmer, stirring, until the juice thickens and coats the apples and the apples start to get tender. Mix the flour, brown sugar, and cinnamon together. Cut in the butter with your fingers until the mixture resembles coarse crumbs. Mix in the crumbled bacon. Roll out the chilled dough into a rectangle about 1/4-inch thick. Cut in circles to fit your tart pans. Press the dough into the tart pans and flute the edges. Spoon 1/6 of the apple filling in each tart pan. Sprinkle with 1/6 of the bacon streusel. Turn the oven down to 350F and continue to bake 15 more minutes or until the apples are tender and the juices thicken. Baking time can vary. Test the apples for tenderness before removing from the oven.